Whether you’re young, old, or in-between, there’s a certain magic to the woods in any season. Thanks to Lilah Brackett’s delightful poem, “Lost in the Woods,” we all can experience the magic of the winter woods from the comfort of our cozy homes. Lilah is a fourth-grader at Mill Pond School. 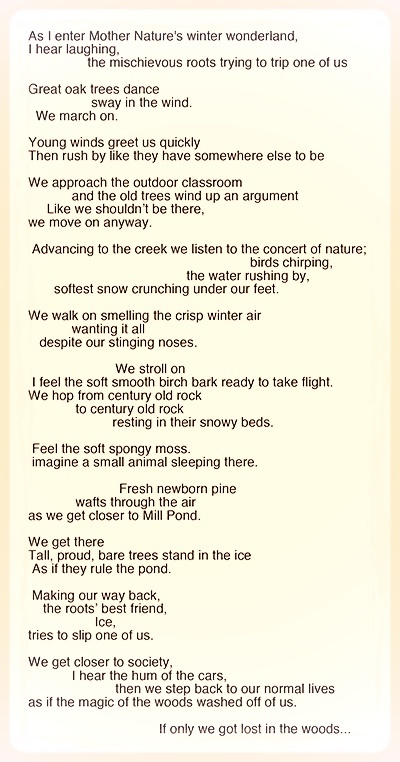 She wrote her poem after her resourceful teacher, Joan Sanders, took her class on a walk on the trails in the Headwaters Conservation Area (HCA), located right next to the school. Click here for the HCA trail map. The January day was perfect for a rare opportunity: a walk to Cedar Swamp Pond. 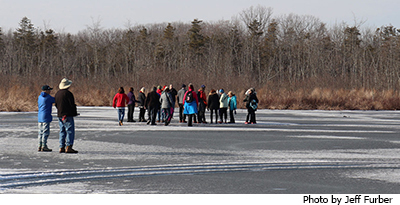 For WCLT’s Cedar Swamp Pond hike, led by Marge Fisher, the weather was mild but the ice was solid enough for walking on the frozen swamp and pond. 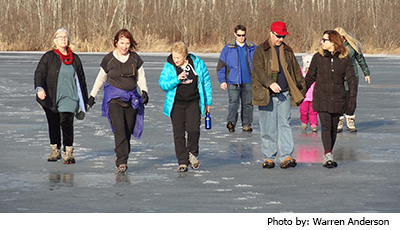 In past years, the weather has often been too frigid, too warm for solid ice, or too snowy for such a trek, so this day was a real treat for the 26 hikers who showed up for the 2.5-mile round trip starting at St. Luke’s fields. Not many people get to see Cedar Swamp Pond because it can be reached by foot only when the swamp is frozen and by canoe or kayak only when water is high in the Sudbury River during a few weeks in spring. Cedar Swamp and Cedar Swamp Pond are the headwaters of the Sudbury River. The pond is a kettle hole, created when a retreating glacier left a buried block of ice that eventually melted, making a depression that filled with water. Several Westborough brooks drain into Cedar Swamp, including Denny Brook, Jackstraw Brook, Piccadilly Brook, and Rutters Brook, plus Whitehall Brook in Hopkinton. The swamp and pond are named for the native Atlantic white cedar trees (Chamaecyparis thyoides) that still grow near the pond. These evergreen trees are easy to spot in winter when little else is green in the swamp. Click here for the South Cedar Swamp trail map. Please wear gloves, long pants, long sleeves, and sturdy shoes. Trash bags will be provided. WCLT thanks our donors: Arturo's Ristorante, Mugford's Flower Shoppe, Roche Bros. Supermarkets, Route 9 Dunkin' Donuts, and both Westborough Stop & Shop stores. 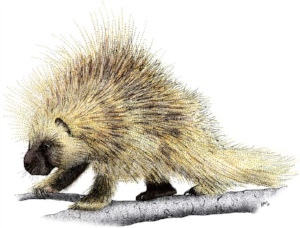 What do a flying squirrel, a fox, and a porcupine have in common? 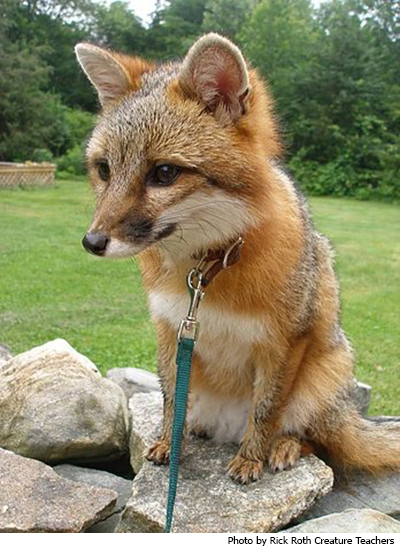 They are all native to Westborough, and you can meet them, plus many more live local animals, at the Westborough Community Land Trust’s free live animal show, "Nature of My Back Yard" presented by The Creature Teachers, on Saturday, March 24, 2018. TWO one-hour shows will take place at 9:00 and 11:00 am. Bring the family – our popular spring live animal show is always a big hit with the young and the curious of all ages! Plan to arrive early as seating is limited. Location: Knights of Columbus Hall, 17 Willow St., Westborough MA; parking lot in rear. Overflow parking is in Arturo’s parking lot, 54 East Main St.; walk around behind the Arturo’s building to cross directly into the K of C parking lot. There is no parking along Willow Street. This spring, Stewardship chair Keith Martin reports that the Stewardship Committee will continue work at the Adams Street trailhead, along the Malley Trail, and on the Orchard Swamp Trail where the section from Haskell Street to East Main Street was severely damaged by a 2016 microburst. You can help! If you regularly walk the trails in Westborough, it’s easy to help us keep the trails in good shape. If you notice any problem areas (fallen trees, trash, graffiti, or trails becoming too narrow due to foliage growth), please send a report by email to Keith at stewardship@westboroughlandtrust.org. If you are interested in becoming a trail monitor, or you are willing to help out with some occasional trail work, send a note to the same address. There is now a mailing list for volunteers, and we’d be happy to add you to it! If you have your own favorite trail in town, write about it for Try a Trail! E-mail us (300 words or less). We can add some trail information and share it with others. Photos welcome! 2) graduating seniors who reside in Westborough but attend a different high school. Scholarships will be awarded in June. WHS seniors can get essay questions, contest details, and scholarship forms from the WHS guidance office as of March 1. Seniors who reside in Westborough but attend a different high school can get essay questions, contest details, and scholarship forms online as of March 1 at the WCLT web site. All submissions must be on paper (not online). Deadline: Monday, April 9. All essays and applications must be received by this date (on paper, not online). Here’s a brief list of upcoming WCLT spring events and important dates. For full information, updates, or cancellations, check the WCLT web site calendar. For more information: WCLT contact. Two $1000 scholarships to be awarded to contest winners. As of March 1, contest details & scholarship application information are available at Westborough High School guidance office (for WHS graduating seniors) and on WCLT web site (for graduating seniors who reside in Westborough but attend a different high school). Our popular spring live animal show is always a big hit with the young and the curious of all ages! Presented by The Creature Teachers. No reservation required. Free; donations gratefully accepted at the door. Supported in part by Westborough Cultural Council and by Westborough Newcomers Club. Plan to arrive early as seating is limited. All submissions must be on paper (not online) and received by April 9. For contest & scholarship details, see Westborough High School guidance office or WCLT web site (as of March 1). Back this year: Optional online signup! Information coming soon. 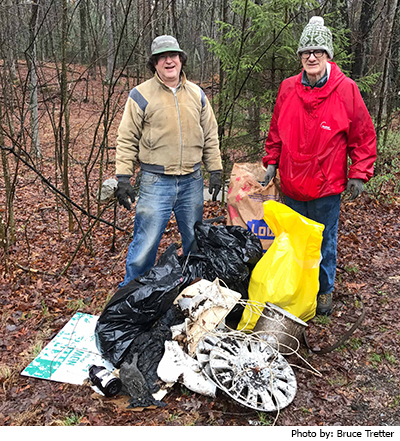 Join the annual town-wide litter clean-up sponsored by WCLT. Come on your own, or rally your family, friends, co-workers, or neighbors and form a team to beautify our town! Trash bags, rubber gloves provided. Meet: Gilmore Pond trail entrance. GPS address: 19 Quick Farm Road, Westborough. Join our new Stewardship chair, Keith Martin, in a springtime ramble through Libbey/Wile Forest, starting at WCLT’s Gilmore Pond. Find out how WCLT’s trails are created and maintained, and how WCLT land is managed for nature preservation and the enjoyment of all. Three-mile walk on uneven terrain with some small hills. No pre-registration required. Program 7-8 pm; reception and Annual Meeting to follow. 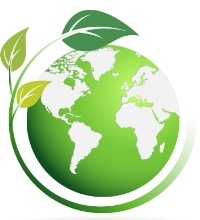 Learn what to plant and what not to plant in order to save energy, use less water, help pollinators, and live sustainably. Speaker Mark Richardson oversees the New England Wild Flower Society’s botanic garden, Garden in the Woods, and its native plant nursery, Nasami Farm. 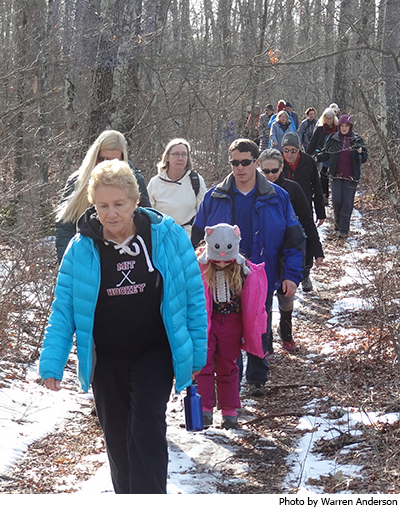 To find out about other, more impromptu guided walks taking place around Westborough, check out Westborough Walks, WCLT’s recently created online Meet-up group. This question sometimes comes up: Are dogs allowed on WCLT property? 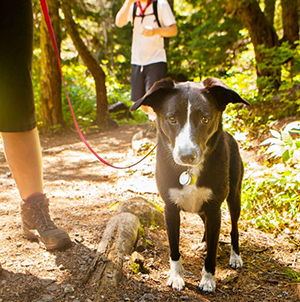 The answer: Dog walking is permitted on WCLT property and trails as long as dogs are on leashes or under their owner’s control. We safeguard land to meet the environmental, recreational, agricultural, and scenic needs of the Town of Westborough and to preserve open space and the natural character of the land. The Westborough Community Land Trust is a 501(c)(3) organization; contributions are deductible under IRS regulations. We are governed by a board of directors elected by the members. Have you seen these Westborough TV videos of 2017 WCLT events? Did you miss Martha Gach's talk on pollinators in early February, "The Birds and the Bees . . . and the Butterflies!"? It's now available on a Westborough TV video click here. Note that events can be viewed on any device, including iPad, iPhone and Android. For older shows you will need Windows media player. Copyright © 2018, Westborough Community Land Trust, All rights reserved.